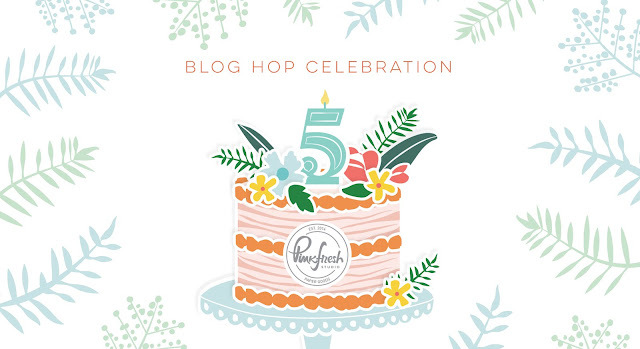 Hello and welcome to the 5th birthday celebration for Pinkfresh Studio!! Isn't it exciting?! 5 years!! I have been with Pinkfresh Studio for a bit and this is a "good people" company. I absolutely adore Kinnari (the owner) and the way she conducts things. You never feel like you are chatting with your "boss", she is so down to earth. If you don't know her, you should! Lea, our manager for everything, keeps us working smoothly. So I have to give them a huge standing ovation for all that they do and then some. I have made three cards today using a panel that I stamped and watercoloured a while back. For the panel, I used the Inked Floral Stamp Set to stamp and heat emboss several images. Then I used the liquid watercolours in Aquamarine, Emerald City, and Sapphire to ink the panel. For the first card, I cut a panel of the watercoloured paper (used Canson watercolour paper) and adhered gold foil die cuts from the Folk Elements Die Set. Sentiment is from My Favourite Things to Say. For this, I used the butterfly die from the Bloom and Grow Die Set. This is actually a coordinating die set to the Bloom and Grow Stamp Set but I used it to die cut my butterfly twice. Once from the watercolour paper and once in gold foil. The sentiment is from My Favourite Things to Say. For my third card, which was actually the first one I made, I drew a circle with a compass and fussy cut it. I adhered this onto my card front and then adhered a gold foil die cut of the Smile Die. I hope you liked my simple cards made out of one panel of watercolour goodness. Each stop on the hop will be giving away a $25 gift card. The winners will be picked from the comments. Winner will be posted on Sunday, April 14th on Pinkfresh Studio GIVEAWAY PAGE. Please check that page & claim your prize within 2 weeks. Your cards are so pretty! I love the blues and the pop of gold. Erum , your work ALWAYS tickles my fancy! Love everything today! 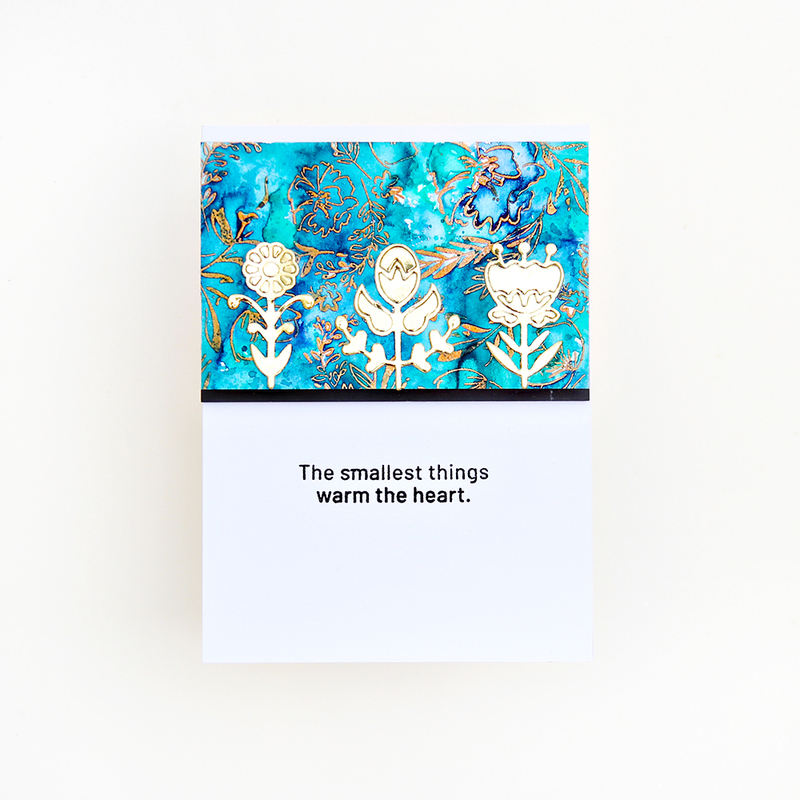 How gorgeous are these cards, love these stamped and watercolored papers you have created. Love the foil bling! Very pretty cards! Wow.. stunning set it f cards ! I just loved the panel with liquid watercolors,looks like made using Alcohol inks. Such beautiful watercoloring! The colors are so intense! Wow! Love these colors together with the gold. So stunning and beautiful. Great job and so elegant looking. Love the color palette you used! What a fabulous treat to eyes...superb watercolor goodness...thanks for sharing!! Love the blue! :) So pretty. WOW..... a trio of beauties!! Love the addition of the gold foil - so lovely! My favourite colours - beautifully watercoloured ... and made ever so chic with the gold!! Inspiring! Beautiful cards! I especially love the gold highlights to make everything pop! Loved your cards. Thank you for sharing. Beautiful trio of cards. Your water-colored background is to die for. I definitely need to check out the liquid water colors; they look awesome! The gold accents in these cards are stunning!!! Wow! I love the bright blue background that you started with. Great way to use it on all you created. Beautiful combination of watercolor and metallics. Love the combination of watercolor and gold. 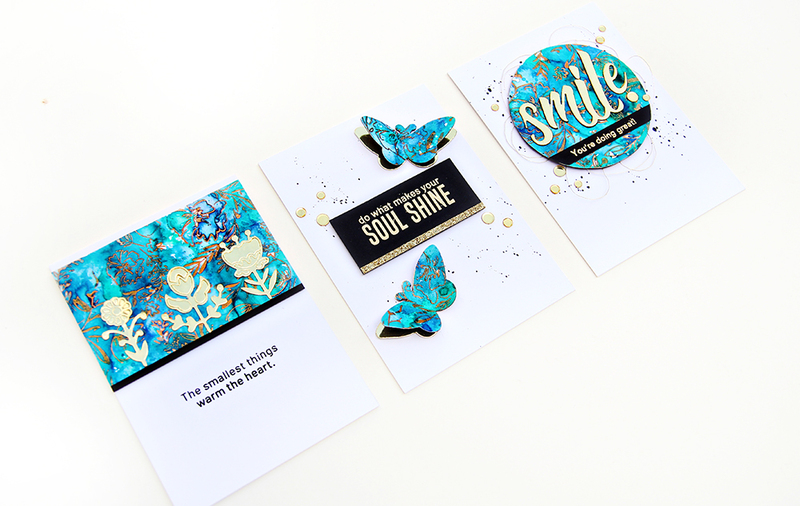 Beautiful cards, love the gold foil elements with this pretty blue/green water coloring, and thanks for sharing how to make multiple cards from one water color piece! Your water coloring is so lovely and rich, great job! Those are some cool backgrounds. Love the gold, too. I love that you used all of the paper you made. It’s gorgeous. Those cards are delicious!! The colors are so bold and look like stone. Thanks for sharing!! Wow! I thought these were done with alcohol inks! Gorgeous!!! Oh my! These are beautiful! 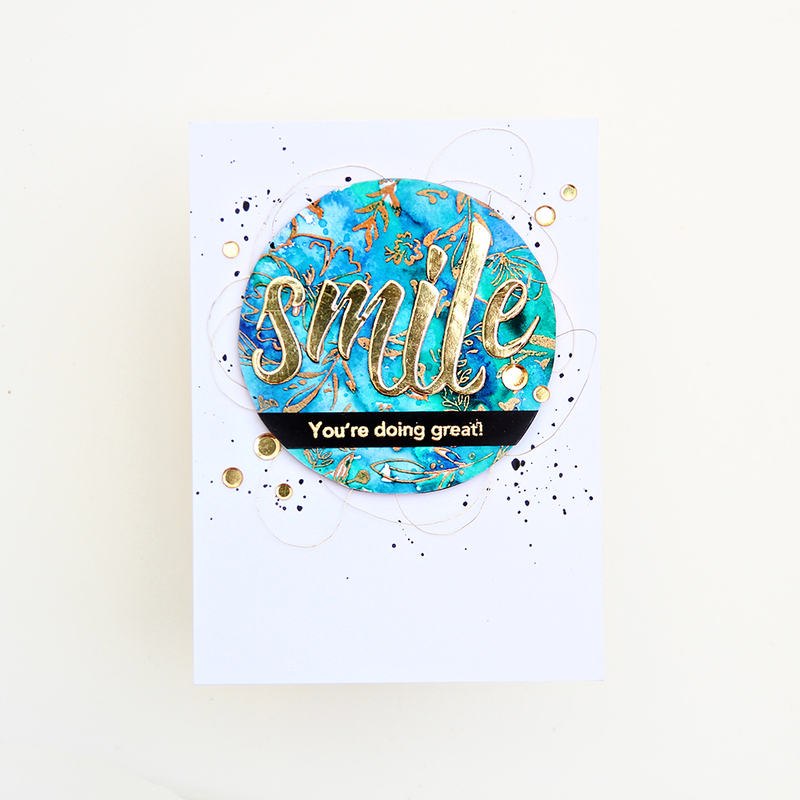 Love the blues with the gold embossing. Looks fantastic. So beautiful in blue, like turquoise stones! Such beautiful cards and LOVE your style! Beautiful card... love the touch of foil! Wow, gorgeous cards! I love the gold and blue hues. The embossing is a beautiful touch. Stunning cards! Love all the details!!! 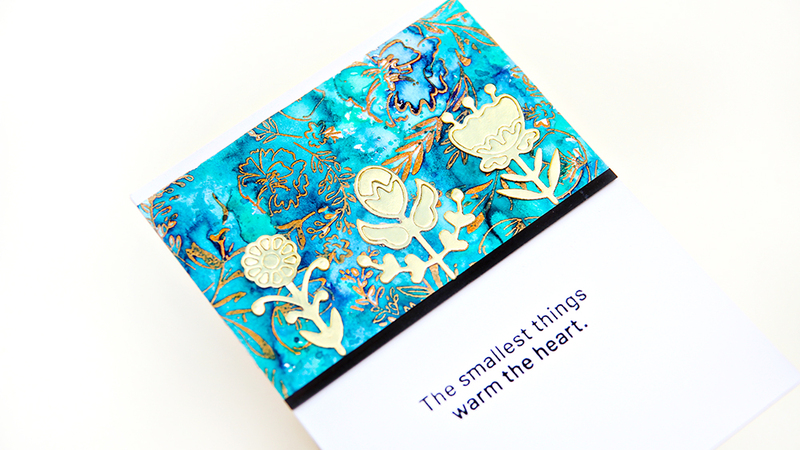 Love the vibrant blues and the gold embossing on this watercolored card. It is eye-catching. What a beautiful play of colors. This is stunning and eye appealing.Thanks for the great inspiration! As always your cards are stunning. I love the colors. I think I like the first one best with its meaningful sentiment. 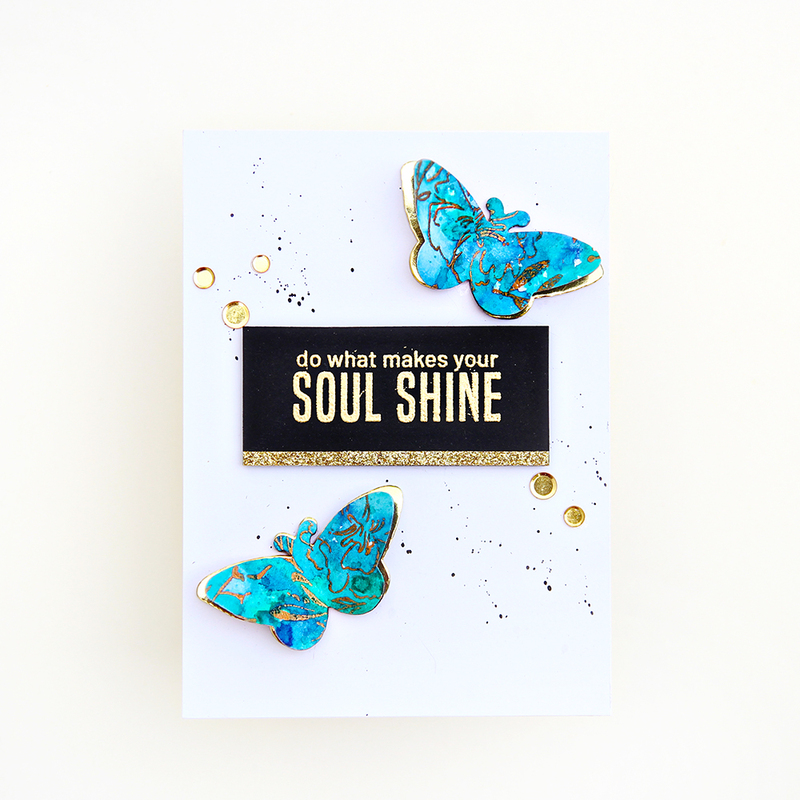 Stunning colors in your backgrounds and love the gold shine to accent your cards! The Blue and Gold together Sings to me!! That panel is gorgeous, Erum!! Love all three cards, too. These cards are gorgeous! The Smile one is my fave with the splatter background and thread. Love the texture! What wonderful creations! Thanks for the inspiration! Gorgeous set of cards! I love the colors you used! Excited to try the watercolors! These colors are beautifully vibrant! Gorgeous cards! Beautiful set of cards! Your work is always so inspiring. Three stunning designed cards from one beautiful panel. Love your work! Stunning, Erum! Yours must be one of my favourite stops along this hop! The colours are amazing, and the designs truly beautiful! Just WOW! Your cards are fab! Love these designs! Thanks for the inspiration! Wonderful, the gold makes them stand out. The butterfly is perfect. Thank you for sharing. So beautiful!!! I LOVE those blue colors, and the pops of gold are perfect!! The watercolors are spectacular and teh shinygold accents them perfectly. Awesome. Your cards are great! Thank you for sharing! Oh my wow! The blues with gold - I looooove it! Fabulous cards! Love all the fun colors and your wonderful style. These are just gorgeous. The blues are just stunning paired with the gold. Your cards are just amazing. Amazing cards.The colours are wonderful. these are lovely cards. the blues/greens and golds together make them look really rich and deep. I love when you can use one beautiful background and make 3 fabulous cards! The colors you used with the gold are perfect! Absolutely love these butterflies. Simply gorgeous. Great use of the Pinkfresh Studio products. Thanks for sharing your creativity! Beautiful cards, love the blue background and butterflies. Oh my, these are gorgeous! Praying I win those watercolors so I can attempt to be artistic and learn from experts like you. Gorgeous! They look like alcohol inks- love the vibrant colors! Ok, I found my favorite cards!! I love love love alcohol ink backgrounds. These cards are beyond words. I love the ink colors you used too. I have the Bloom and Grow set, you have given me the inspiration to get it out today and play with it along with some alcohol inks. Thank you for sharing!! Your cards are amazing those colors and the touch of gold absolutely beautiful!!! I almost thought these were alcohol inks! Those colors are so vibrant, think I'll have to try some of these liquid watercolors! Erum your cards always WoW me & these are no exception. I am amazed at the depth of colour you've achieved with these liquid watercolours!! They remind me of alcohol ink with the richness of them. Love love all of them! I like the cards you were able to create from this pretty panel. Your cards are always so awesome. Your use of gold foil is spectacular and these cards are exceptional! Love these gorgeous cards. The smile card is especially stunning. Congrats to Pinkfresh Studio on completing 5 years. I love your products. Wishing you many more successful years ahead. The watercolor background that you created with these liquid watercolors is amazing. What a beautiful array of cards from this one background. I definitely want to try these because of their vibrancy. Wow, your cards are stunning! 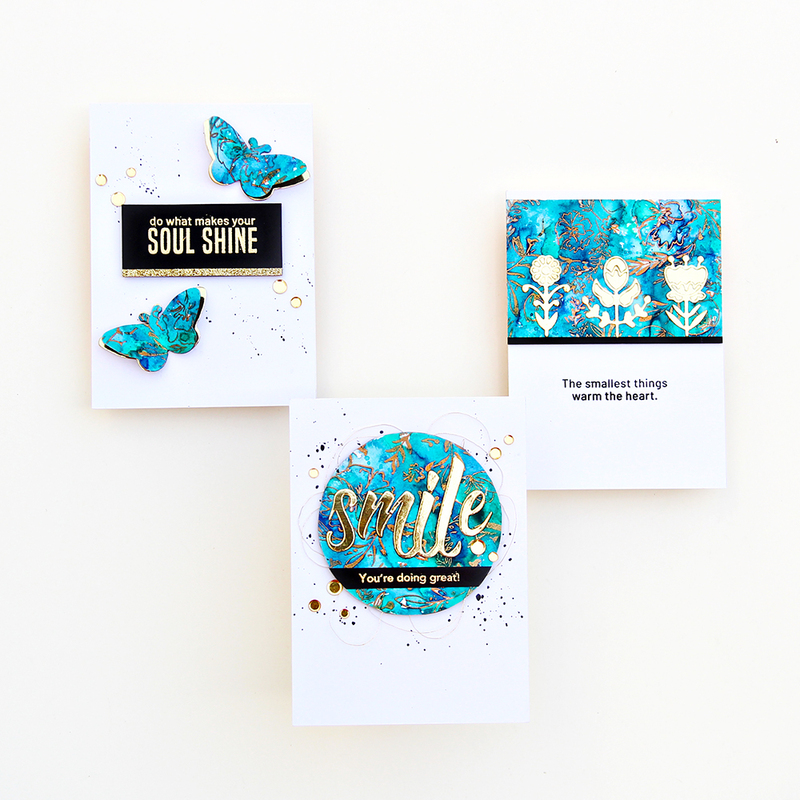 The watercolors are so vibrant, that combined with the gold embossing, resemble alcohol inks. The designs are gorgeous, and I love how you used the one panel to create all three cards. These panels are so bright, I thought they were made with alcohol inks! 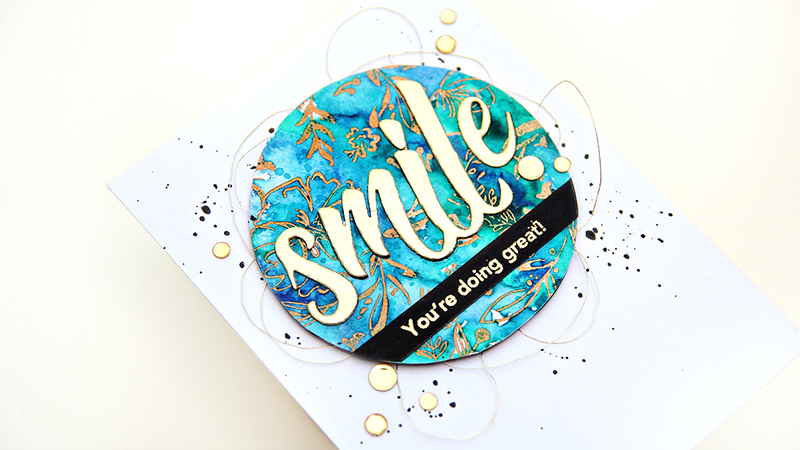 What beautiful cards you've made, and they show off Pinkfresh's products perfectly. Thanks for sharing with us! The embossing against the blue background reminds me of alcohol inks 😍 Mahalo for putting on such an awesome blog hop! 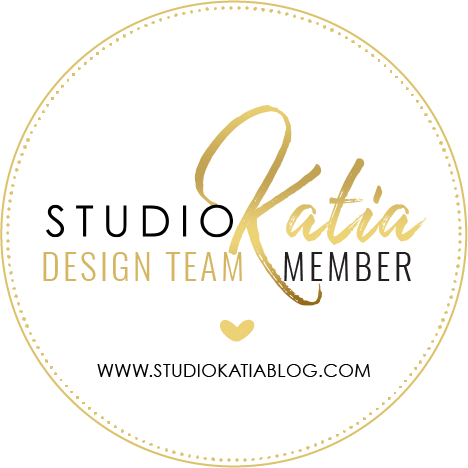 I am in love with everything the design team has created!! Good luck everyone! Love love love the projects you made from that gorgeous panel you created. 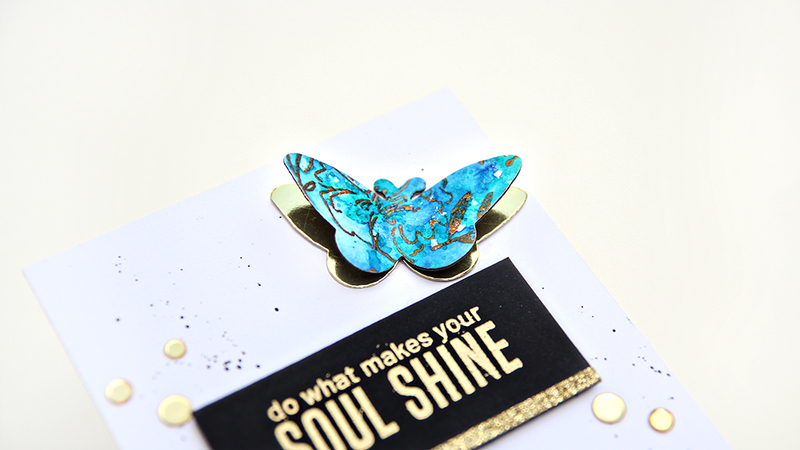 The vivid turquoise with the gold is totally making me swoon!! Love the gold with your blues! Really makes it POP! Oh so gorgeous! I love the intensity of the blue alcohol background and the gold embossing is so elegant. These are beautiful. I absolutely love the color combinations and the touches of gold to make it shine. Love the beautiful rich blues in your watercoloring! oooooooooooo!!!! LUV the watercoloring. and THEN luv what you created from it!! oh those colors!! !